Smith attended Maury High School and played at the University of Maryland. 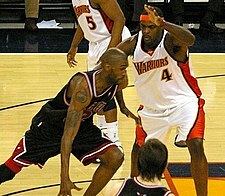 In the 1995 NBA draft, Smith was selected by the Golden State Warriors as the first overall pick, before fellow power forwards Kevin Garnett, Antonio McDyess and Rasheed Wallace, as well as guard Jerry Stackhouse. 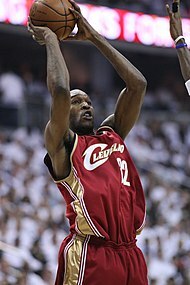 Smith was named to the NBA All-Rookie First Team for the 1995–96 season and finished third in the Rookie of the Year voting to Damon Stoudamire and Arvydas Sabonis. Following the 1999–2000 season, it was discovered that Smith was involved in a salary cap–evading scandal involving Timberwolves owner Glen Taylor and general manager Kevin McHale. Smith was allegedly promised a future multimillion-dollar deal if he signed with the team for below market value, allowing the team to make some additional player moves in the short term. As part of the deal, Smith signed three one-year contracts for less than $3 million apiece, allowing the Timberwolves to retain his "Bird rights" and exceed the cap to resign him. At the end of the last one-year contract, Smith could have signed a new long-term contract that would have paid as much as $86 million. The beginning of the end for the illicit deal came when Smith's agent, Andrew Miller, left the sports marketing firm helmed by Eric Fleisher and retained Smith and Garnett as clients. Fleisher sued, and details of the illegal contract came to light in discovery. NBA Commissioner David Stern severely punished the Timberwolves in response. He fined the team $3.5 million and voided all three short-term contracts–and with them, Smith's "Bird rights." He also barred Taylor from having any role in the Timberwolves' operations until August 31, 2001, and forced McHale to take an unpaid leave of absence through July 31, 2001. More seriously in the long run, Stern stripped the Timberwolves of their first-round draft picks in 2001, 2002, 2003, 2004 and 2005 (though the 2003 pick was ultimately returned). The move hurt the Timberwolves in the long run, as while the team still found success, the lack of draft picks denied them a chance to add more depth behind Garnett. This set the team up for their eventual failure in the mid-2000s, from which the franchise has never really recovered. Since advancing to the Western Conference finals in 2004, the T-Wolves have tallied only two winning seasons. Smith continues to coach in the greater Atlanta area with the private coaching service, CoachUp. Smith has recorded a solo rap album under the pseudonym "Joe Beast". Included on the album are tracks titled "Murda Kapital" and "I Does This". The album was produced in Oklahoma City, by Tommy Switch and Lorin Roberts, while Smith was playing for The Oklahoma City Thunder. ^ "Joe Smith (biography)". NBA Media Ventures. 2009. Archived from the original on March 3, 2011. ^ Most traded NBA players include: Joe Smith, Chucky Brown, Tony Massenburg and Jim Jackson. "Most Franchises Played For". basketball-reference.com. Archived from the original on April 10, 2014. ^ Millea, John (2000). "Lonewolf". The Sporting News. 224 (48): 10. ^ Brian Sampson (April 24, 2017). "What If Joe Smith Didn't Sign An Illegal Contract?". FanSided. ^ a b Sean Highkin (January 9, 2014). "The bizarre saga of Joe Smith's illegal Minnesota Timberwolves contract". USA Today. ^ J. A. Adande (October 23, 2000). "Minnesota Feels Stern's Wrath". Los Angeles Times. ^ "Bulls sign veteran forward Joe Smith". July 19, 2007. Archived from the original on June 30, 2007. ^ DeMocker, Michael (February 17, 2009). "New Orleans Hornets trade Tyson Chandler to Oklahoma City". The Times-Picayune. NOLA.com. Archived from the original on July 3, 2014. ^ Smith, Sekou (August 26, 2009). "Atlanta Hawks sign Joe Smith". Atlanta Journal Constitution. Archived from the original on July 3, 2014. ^ "Nets Sign Veteran Forward". The New York Times. Associated Press. September 11, 2010. Archived from the original on July 3, 2014. 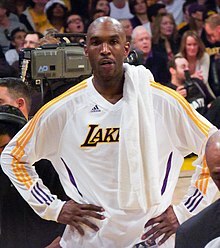 ^ "Lakers acquire joe smith in three-team trade". NBA.com. December 15, 2010. Retrieved December 15, 2010. ^ Stephenson, Colin (December 15, 2010). "Nets make three-way Terrence Williams deal official". The Star-Ledger. Retrieved May 23, 2011. ^ "Pistons vs. Lakers - Box Score - January 4, 2011 - ESPN". ESPN.com. Retrieved January 31, 2017. ^ Steele, David (November 20, 1996). "Smith Plays Hawkins In HBO Movie". Sun Sentinel. Archived from the original on July 3, 2014. ^ "Most Franchises Played For". basketball-reference.com. Retrieved December 10, 2010. ^ Turner, Jamie (April 20, 2009). "Sing it out: Cavaliers' Joe Smith pushing for an NBA title, and for rap music success, too". The Plain Dealer. Retrieved December 29, 2010.